1 bedroom Cabin, Private and Cozy, with a Beautiful Mountain View! Location, Location, Location! Just minutes from downtown Gatlinburg and in the heart of the Arts and Crafts Community. Easy travel with minimal traffic, to and from Pigeon Forge using Stoplight 1, via the National Park. It's a close and easy drive to all area attractions and restaurants, yet tucked away in a nice, quiet private setting. The comfortable sofa is perfect for stretching out in front of the fireplace and watching TV, or reading a good book. It also pulls out to a queen size sleeper with a brand new comfortable mattress. Or you can choose to enjoy a good game of pool. The bedroom is outfitted with real log furniture and a comfortable king sized bed. Also with a spacious bathroom with a private two-person jacuzzi tub. The fully stocked kitchen allows you the option of having a romantic meal at home, where you can also enjoy the warmth of the gas-log fireplace. Plenty of space between neighbors allows for privacy when relaxing in the brand new outdoor hot tub and enjoying the mountain view. Spacious, level yard for outdoor games. Easy access to all attractions, but still private and tucked in the mountains. Level parking area with easy street access. This cabin provides a perfect, peaceful, and stress-free getaway. My childhood vacations always included passing through the area on our way to see family in Tennessee. We have always enjoyed the beauty and peacefulness that the mountains have to offer. After hiking the Appalachian Trail several times, we knew that we wanted a place near Gatlinburg. This cabin is our dream come true and we are pleased to share it with our guests. We only ask that our guests treat the cabin with kindness and respect, so others can enjoy it also. 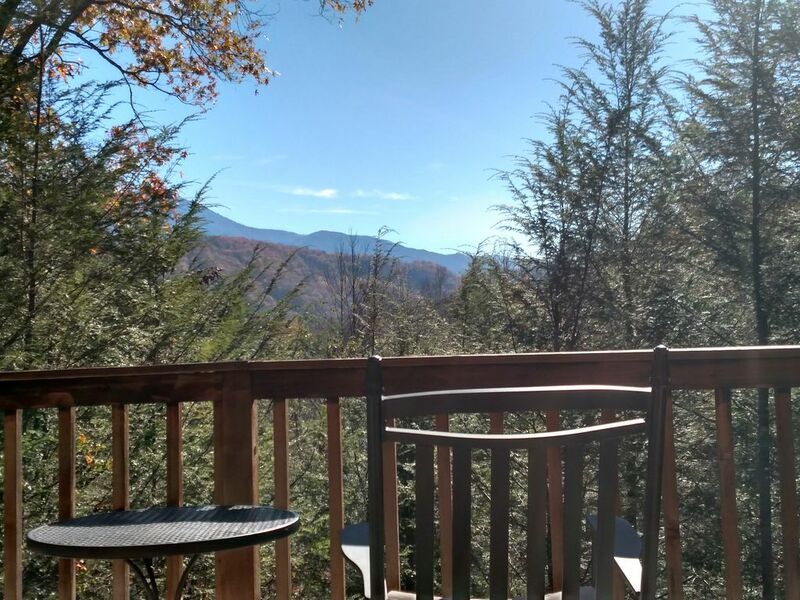 We chose Mountain Joy because it it is located just minutes from downtown Gatlinburg and the Arts and Craft Community, and yet it is tucked away in the mountain which allows for privacy. The roads are well maintained easy to navigate. Nice level parking with easy street access. We also love the level yard which offers a lot of room for outside activities. We chose this cabin for it's beautiful mountain view, location and privacy. The roads are easily accessible and well maintained. Close to all the attractions and restaurants and yet tucked away in a nice quiet private setting. Very spacious floor plan with lots of natural light offers a comfortable place, with a beautiful view, for your getaway. We pride ourselves in the cleanliness of our properties. toilet, shower, jetted tub, Clean and spacious! Comfortable new patio chairs to enjoy the great mountain view. Brand new hot tub. Beautiful mountain view. Private. Very nice and clean great views! Close to town yet secluded. It was beautiful and the hot tub was great! I couldn’t have asked for a better spot to honeymoon!! We enjoyed our stay at this house that was close to everything and had everything we needed. The cabin was very cute and nice and clean. We enjoyed the stay there. The cabin was nice with a beautiful view. It was very clean and we enjoyed ourselves. We arrived to find that some construction had been occurring nearby and an unfortunate accident affected water flow to the cabin. Jim worked tirelessly to help us enjoy our stay in Gatlinburg without having to worry. Constant communication and a wonderful workaround allowed us to carry on and fulfill our vacation plans. Located just minutes from downtown Gatlinburg and in the heart of the Arts and Crafts Community. Easy travel with minimum traffic to and from Pigeon Forge by using Stoplight 1, via the National Park. Check-in is 3pm. Check-out is 11am. Cancellation Policy: More than 30 days (100% refund) Between 14-30 days (50% refund) Less than 14 days (0% refund) We will not share any of your personal data for any reason with 3rd parties.